Hazrat Nizamuddin Dargah is a famous shrine dedicated to the famous Sufi saint Hazrat Nizamuddin Auliya, who spearheaded the Chisti order of Sufism in India. Years after his death in 1325, a rich merchant built the structure and it was then renovated by Firoz Shah Tughluq. Tombs of many other people surround the dargah. It includes that of the renowned poet Amir Khusrau and Shah Jahan's daughter Jahanara. Amir Khusrau, a famous poet, was a beloved disciple of the saint. Hazrat Nizmuddin had a large following which included names like Alauddin Khilji, Amir Khusrau, Mohammed bin Tughluq. The emperors during their royal processions halted at the tomb to pay their respect to the saint. The famous Mughal emperors such as Humayun, Shah Jahan, Akbar, Babur and Jahangir used to visit this shrine to pay homage to the saint. The tomb consists of an ornate square chamber surrounded by lawns. 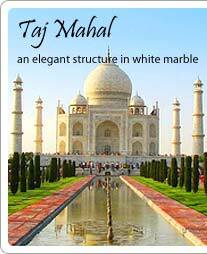 The beautiful domes are punctuated by black marble stripes while a lotus occupies the centre of the dome. The mausoleum has a prayer hall called the Jamaat-e- Khaana. The saint was well-known for his spirit of tolerance and this is probably why it drawn numerous pilgrims everyday. Qawali music and incense sticks add to the Dargah experience. 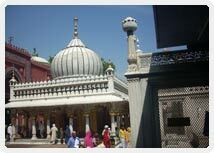 The Dargah is located in the Nizamuddin West area of Delhi and is visited by people of different religious backgrounds. Visit the Dargah on Thursday evening when qawwali singers perform after the evening prayers.